In the early hours of Monday morning, history was made on the occasion of KSA’s (King Sunny Ade) 70th birthday and 50th anniversary on stage, which held at the Federal Palace Hotel and Casino. The legendary musician’s vintage Fender Telecaster Guitar was auctioned off at an astounding N52.1 million, thanks to the masterful artistic design by none other than – Victor Ehikhamenor. Victor Ehikhamenor is a prolific and award-winning visual artist, writer, and photographer, whose influence in the sphere of innovative and contemporary art, is worthy of discourse. The Udomi-Uwessan native of Edo State received his University education at the Ambrose Alli University (BA degree in English and Literary Studies) and University of Maryland (MS in Technology Management and MFA in Creative Writing). He shuttles between Lagos and Maryland, where he maintains studios. Born into a family of artists spanning over 3 generations (cloth weaver grandmother, blacksmith grandfather, local artist mother and photographer uncle), it seemed only natural that he would pursue a career in the Arts. Victor Ehikhamenor whose work is abstract and usually politically motivated, is strongly influenced by the duality of African traditional religion and the interception of Western beliefs, memories and nostalgia. He is also inspired by his grandmother as well as wall paintings and installation arts, mostly in community shrines. An author of a book of essays ‘Excuse Me!’- a satirical creative non-fiction view of life as an African both at home and abroad- he has recorded immense success as it has been adapted as a text for some Nigerian universities. In the area of photography, Ehikhamenor’s works have been used for editorials as well as cover art on books by authors such as Chimamanda Adichie, Helon Habila and Chika Unigwe. They have also been illustrated on fabric and exhibited at international fashion parades. 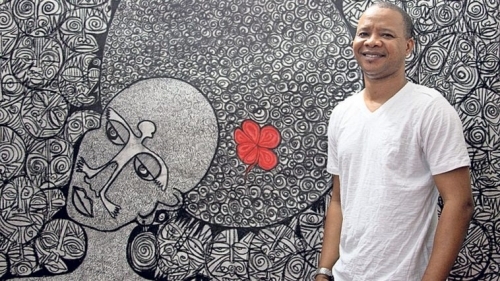 A successful visual artist in his right, he has held numerous successful solo art exhibitions across the world and was one of 11 Nigerian artists invited to join twenty-three Indonesian artists in the grand exhibition at the Biennale in 2016. And of course, the record-breaking N52.1 million guitar, among his other achievements, will be spoken about for years to come.